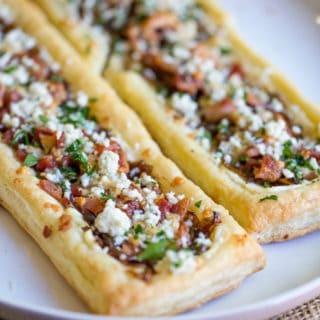 Bacon Blue Cheese Caramelized Onion Tart with just five ingredients total, it is the perfect easy appetizer for a party that can be prepped and frozen ahead of time so you can just bake right before your party! Lay the two rectangles of puff pastry onto a silicone baking mat or on an oiled baking sheet. Spread with cream cheese, leave 1/2 inch border all around the edges. Spread caramelized onions over the cream cheese. Sprinkle on the bacon and shake on half the Blue Cheese Simple Seasons. Let cool for 2-3 minutes, then sprinkle with the remaining blue cheese and parsley (if desired) and serve in slices or wedges.